While it is being widely reported that Nadya Suleman, the California mother of octuplets born last month is not receiving offers for free products and care, it may seem that this isn’t true. She is just being picky as to which ones she accepts… The founder of a nonprofit nurses’ group says that the busy mom allowed an offer of free, 24-hour care for the infants and six older children to lapse. Linda Conforti-West, founder of Angels in Waiting, said today that Nadya Suleman appeared to lose interest in the group’s proposal when she was told last week that a reality show and a biweekly press conference on the babies’ condition was out of the question due to their fragile immune systems. Angels in Waiting’s offer, which included a new home, expired Thursday at midnight. Suleman’s publicist could not be immediately reached for comment. 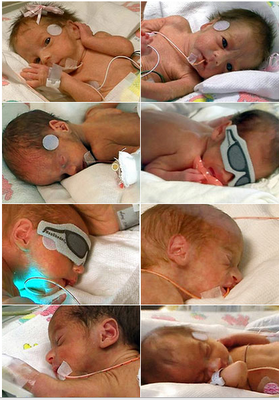 Angels in Waiting specializes in care of premature babies. This whole entire story makes me so angry!!! She had absolutely NO right to do what she did. I know the babies are here now, but I don’t think that she is capable of caring for them. And it makes me sick that people are offering her all of these different things. I could go on and on about her but she isn’t even worth my breath. I am glad that people see the reality of her mental health problem, instead of rewarding her for creating a risky lifestyle for children.